The extra-length issue contains stories by a number of creators, including outgoing Action Comics writer Dan Jurgens, but it’s “Suprema Est Lex” by Mark Russell and Jill Thompson that’s likely to gain the most attention; not only does it offer a glimpse inside Luthor’s head, it also takes place at an event currently in the headlines: the White House Correspondents' Dinner. 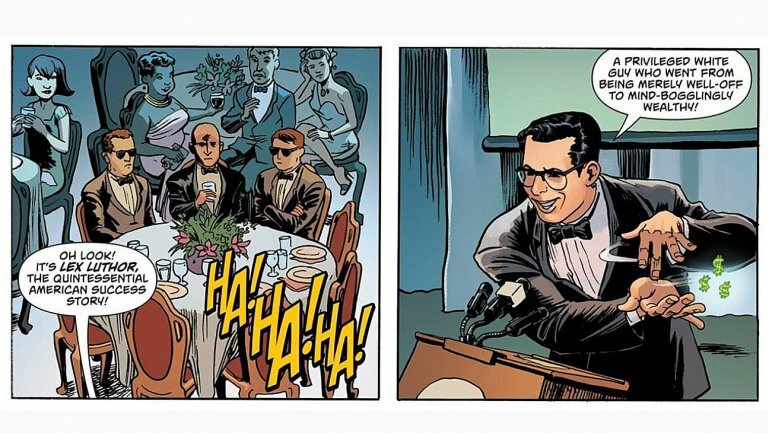 The story looks back at a moment in which Clark Kent delivered remarks at the Correspondents' Dinner, and poked fun at Lex Luthor. It's a story that drew inspiration from Seth Meyers' 2011 roasting of Donald Trump at the dinner, which comedian himself has speculated caused Trump to run for President. Heat Vision talked to Russell about the crafting the story and whether Trump really does have parallels to Lex Luthor. Congratulations on a story that has become amazingly topical, thanks to what happened this past weekend. Did you have any idea this issue would come out days after this year’s White House Correspondents' Dinner? Was this just an incredibly lucky coincidence? It’s completely a coincidence. I pitched this months and months ago, and wrote it two and a half months ago; I guess a little research might have shown it was coming out around the same time [as the actual WHCD], but I had no idea when it would come out. I'd say that's disputable. It's always possible they could've made last minute changes to the script and issues in preparation to suit the scenario they want it to resemble; these things can and do happen at times. If he really set out to attack Trump, he doesn't have the courage to say so. It’s impressively timely, especially in the wake of Michelle Wolf’s speech and the response to it. Yeah, it really worked out well. (Laughs.) I couldn’t have asked for better timing from the comic. It’s based on past White House Correspondents' Dinners, which are now even more important — or a bigger bellwether on the health of our democracy — now that Donald Trump is president. Naturally, he won't admit health of democracy was ever an issue under Obama's administration. It's only to be questioned whenever a Republican's in office. It was really a story about Lex Luthor, and the function that a sort of lese-majeste plays in our democracy. How you need to worry about someone who takes themselves that seriously; it’s kind of the worst attribute someone can have in power, to take themselves so seriously. It leads them to believe they’re infallible, and that’s when they double down on their worst attributes. Why not just create a new character and not rely on an old one, even when it comes to villains? 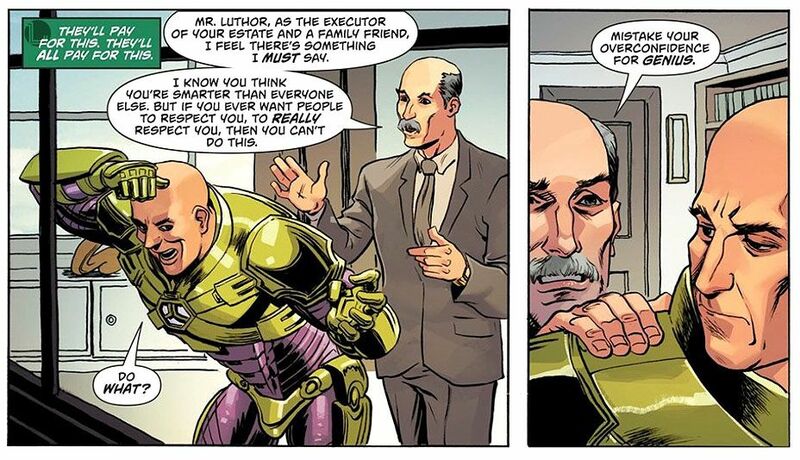 This may not even be the first time Luthor was used as a stand-in for politicians; in the early 2000s, they may have used him to metaphorically represent Bush Jr, for pretty much all the wrong reasons. What's more, Russell's words could just as easily describe a leftist like himself, because he's the kind of buffoon who does little more than virtue-signal. And if the tale's far more about Lex than Clark, I think that's another flaw in the writing. There may have been too many spotlights on villains since the turn of the century, with both Marvel and DC bearing some guilt in putting villains above heroes in this regard. Also, it's SJWs who're obsessed with doubling down, due to their lack of satisfaction with anything, and who pretty much believe they're infallible at anything. The story makes clear the contrast between how Lex Luthor sees himself and how the world sees him. I don’t want to be too obvious, but the Lex Luthor as Donald Trump analogue is very clear here, especially the way the story mirrors Seth Meyers’ 2011 speech at the Correspondents' Dinner. Do you see Trump as a Luthor-type figure, or is it more about the ego of both, and their shared desire to be close to power? It’s all about the ego and closeness to power. I don’t see [Trump] as having, even, the foresight to be much of a supervillain. It’s more about the danger that ego poses to power — what a bad combination that is. And it really is, in large part, based on the White House Correspondents' Dinner that Seth Meyers did, where he was roasting Donald Trump and you see Donald Trump in the background, steaming, getting increasingly angry and more uncomfortable. This comic is, what was going on in that person’s head while they were sitting there. Someone who takes themselves so seriously, what goes through their head when they’re confronted with people laughing at them? So, he's implying Trump's just terminally stupid, huh? Yawn. What about Hillary Clinton's own demonstration of anguish and uncomfiness? That doesn't worry him? Oh, guess not. That's why I'm laughing at Russell. Yes, seriously. Because he's so smug in his social justice platform, he just doesn't understand why he's little more than a modern Don Quixote. Something that occurred to me, in drawing parallels between Lex Luthor and Donald Trump is that Luthor is traditionally portrayed as an evil genius, with the genius part actually being present; it’s not only ego. But Trump has only his own success to back him up, and he falls clearly into the description you gave of someone born into privilege. Is the comparison between Luthor and Trump unfair to Luthor? That’s a good point! Lex is canonically a genius. But this isn’t a story about whether he’s a genius or not, it’s about the moral failure of your own certain destiny and infallibility. It’s not about your ability to back it up. As expected, he won't admit a liberal can be born into privilege, winning all the favoratism he/she wants. Hey, it worked for the Clintons in the past, didn't it? And if Trump ran successful businesses in the past, and people who did good work under his employ made great salaries from him, then why is it only his success they're talking about? Plus, why don't the reporter and interviewee ponder their own moral failings? Looking at your work on The Flintstones and Exit Stage Left: The Snagglepuss Chronicles, I have to ask: Are you surprised that these kinds of pop-culture characters offer this level of ability to comment on society and politics, and do so in a way that can be read both as a straight-through story without allegory, but also with the allegory clear for those looking for it? I think that’s what pop-culture characters are there for. They’re there to let us look at ourselves without becoming too defensive. They’re there to allow us to look at ourselves in the abstract and look at the failings that we have, without feeling like we’re under attack and being humiliated. Are there other characters or projects that you’d like to approach with that in mind? As terrifying as it can be to live through, this is a very fertile time for commentary because we’re going through such change, and regression, societally. Are there characters where you think, "Oh, I’d like to work with them to make this point"? I’m doing the Judge Dredd story that’s largely doing exactly what you’re talking about; about retrenchment, about a society trying to put a lid on what it’s ignored for so long that it’s become dangerous. Trying to ignore that you’ve made such horrible foundational errors that they only way to fix it is with violence. That comes out May 30. The one character I’ve always wanted to write, that I’d be fascinated to write, would be Scrooge McDuck; it’s hard to imagine a better analog for critiquing late-stage capitalism. Now ain't that rich coming from somebody who has no issues about capitalizing on the very creations and properties he's been assigned to write, including the UK comic infamous for depicting the USA as a totalitarian police state. So socialism never has any accountability for the same, huh? It's destroyed Europe and other countries that pushed it like Venezuela. If he winds up writing Uncle Scrooge, chances are it'll be in the guise of a bad guy, mainly because modern Disney executives are so corrupt, there's little chance they'd defend Walt's famous creations. Nevertheless, the news anchors openly admit that the world they now occupy is not the one they ever expected to cover. 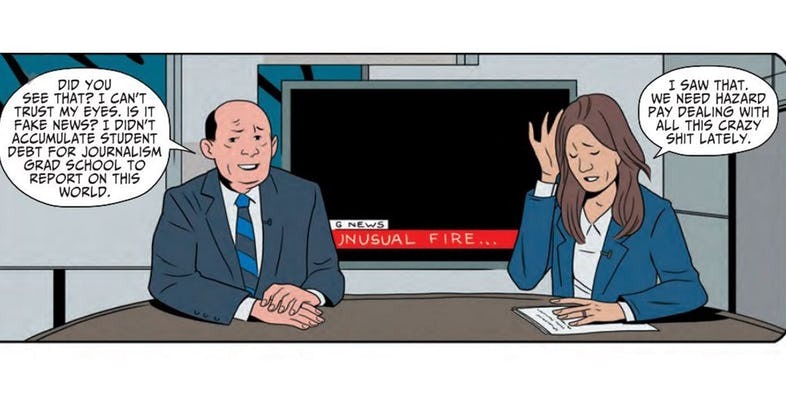 While not explicitly criticizing President Donald Trump’s administration, the scene offers commentary on the accusations of “fake news,” and the deeper mistrust of government officials. It’s not possible for a drug to create hallucinations through a camera, but the government agent dealing with the situation is willing to claim it with a straight face, leaving the anchor in search of the truth unsure how to react. Mistrust that wouldn't exist if a Democrat had been elected to office. Failure to admit a newspaper's staff can manufacture a false story, all to suit their narrow visions, does nothing to help ensure there won't be any fake news in the future. And these examples should serve as a vital warning that where Marvel may be avoiding explicit politics just now, DC's clearly delighted to fill in the void for their fellow lefties in attacking Trump over all the wrong reasons, and insult everyone's intellect with the very social justice machinations we'd be more comfy not seeing in books that are meant to be entertainment first and foremost. That's why DC fans have to be on the lookout for this terrible propaganda just as much as Marvel fans do.